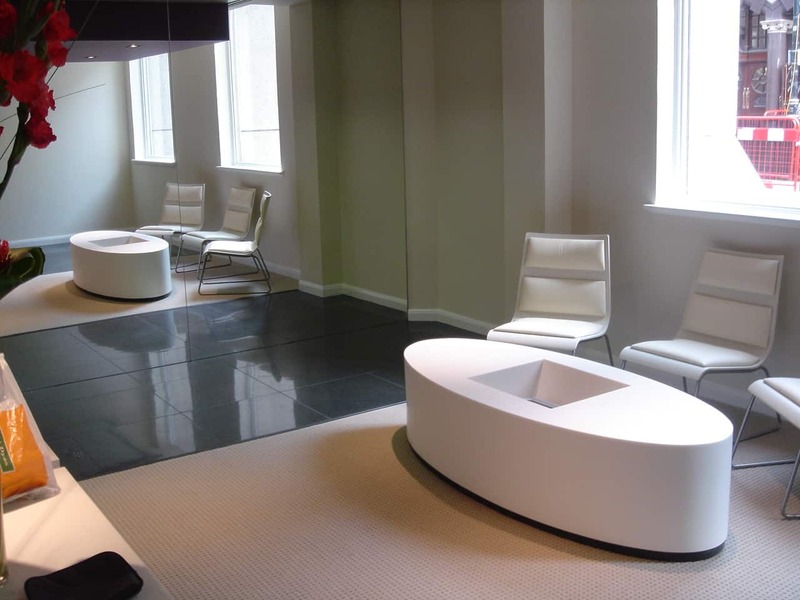 Why should you choose Solid Surface over other surface options for your interiors? Solid Surfaces such as Corian, Hi Macs, Staron, Hanex, Durat, Avonite and Tristone are not new products to the market place, however, sometimes the extent of their potential as a material to choose is not recognised. So why opt for a Solid Surface over other hard surface choices such as marble, granite, engineered stone, stone and wood? Solid Surfaces can be seamlessly jointed, so that any joins are inconspicuous. Homogenous- consistency of colour throughout the sheet and cannot delaminate. Versatile – can be machined and shaped into almost any design- we at BSF have the ability to thermoform three dimensionally creating even greater possibilities. Hygienic as the materials are impervious to germs and liquid, making them easier to keep clean. Ideal for use anywhere- the home, the office, hospitals, schools, universities, the list is endless. Covered by ten year warranty. Attractive in appearance with over 600 available finishes – and an ever growing range.